College football is just around the corner -- we’re less than five weeks away from the Gophers’ season opener on Aug. 30. So, with that in mind, I’ll take a look at Minnesota’s 12 opponents by asking five questions to a beat writer covering that team. Today’s installment is Game 6, at Ohio State. 1. J.T. Barrett accounted for more than 12,000 yards of offense and nearly 150 touchdowns in his career. How will the Buckeyes replace such a prolific quarterback? 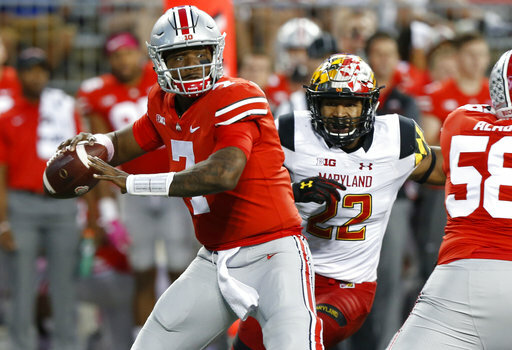 The Buckeyes already have replaced Barrett a couple of times, in 2014 with Cardale Jones, who did great things in the three-game sprint to the first College Football Playoff national title, and with Dwayne Haskins Jr. last year in the direst of circumstances: Late third quarter, at Michigan, trailing, and he leads them back to victory. Confidence is high on the team that Haskins has the right stuff, especially in terms of perhaps taking the passing game to a higher level, and that his backup Tate Martell potentially is as elusive a playmaker as there might be in the league. Of course, neither has ever started a college game, and Martell has never played in one, so there is that. 2. With J.K. Dobbins and Mike Weber returning at running back, how do you see the carries being split? Headed into camp, Dobbins, who set the school freshman rushing record last year, is No. 1 while Weber, who rushed for a thousand yards as a redshirt-freshman in 2016, is the 1A. There have been strong hints that both could be on the field at the same time at times in an enhanced version of the zone read option. But as is the case for most schools when they have two capable backs, each likely will see action on a rotating basis, with the man showing the hotter hand getting the call at crunch time. But really, who knows? 3. Defensive end Nick Bosa could end up being the No. 1 overall pick in the 2019 NFL draft. How does he improve on his standout sophomore season? Ask Nick, and he's always talking about improving his “get off,’’ that blink of an eye when the elite defensive linemen gain an edge on the blocker(s). His improvement likely won't be that noticeable to the layman, since a percentage here or there for a defensive lineman often is lost in the chaos of the play. But with the Buckeyes losing three defensive ends to the NFL draft and with proven depth shallow compared to a year ago, there's a great chance he actually will play more plays than a year ago, which likely will translate into his numbers rising. ... the Buckeyes take care of business in a workmanlike sense. Ohio State will be the more talented team, which usually brings victory. ... the Buckeyes lose their edge and their way, such as what happened to them in the shocking lopsided loss at Iowa last year. So, you're saying there's a chance? Yes.